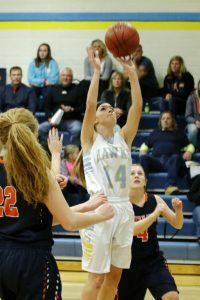 The Lynnville-Sully girls defeated a couple of conference teams by nearly 30 points each in the past week of action. On Tuesday, Dec. 5, the Colfax-Mingo Tigerhawks traveled to Sully for an inner-conference game. The L-S girls improved to 4-2 after a 56-27 win. Junior Carson Fisk grabs the ball from an HLV player being guarded by senior Jataya Meyer. The Hawks’ defense kept L-S in control for the whole game and limited C-M to single-digit scoring in every quarter. They also forced 34 C-M turnovers. Senior Mariah Vos led the team in steals with six followed by seniors Camryn Russell and Jataya Meyer with three. 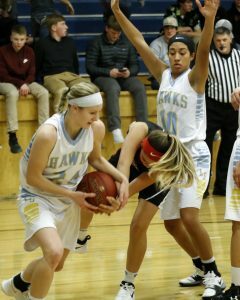 The Hawks had a total of eight girls with one steal or more and had a team total of 20. “I thought we had better energy on the defensive end. We were not able to convert turnovers into points but kept Colfax Mingo from getting into a rhythm on offense. Our offense was good when we attacked the rim and moved the ball quickly,” said L-S Head Coach Jerry Hulsing. L-S jumped out to a 16-7 lead in the first quarter. The Hawks also had a solid third quarter, outscoring C-M 21-8 to go up 46-20. The Hawks had strong performances from junior Carson Fisk, sophomore Mallory Loftus, and senior Mariah Vos. Fisk led in points with 19 and in rebounds with 11. Loftus was the second-leading scorer, and she added 13 points and four rebounds. Junior Shiloh Cunningham contributed eight points and four rebounds. Vos led the defense in steals with six, and she also added four rebounds and six points. “It was good to see us play as one. It was fun to come out and run up and down the court while moving the ball around fast and finding open spots. That was key for us to put the ball in the basket. Also, our defense shined tonight as we forced a lot of turnovers out of Colfax,” said Fisk. Sophomore Mallory Loftus lifts off a shot against the HLV Warriors on Friday, Dec. 8. She finished with nine points at home. Three nights later on Friday, Dec. 8, the winless HLV Warriors (0-6) came to town hoping to find a W. The Hawks started strong, scoring 14 in the first quarter and 18 in the next to go up 32-10 at the half. The Hawks ended up winning easily, 50-22, by sharing the ball. None of the eight players who scored reached over nine points. Meyer and Loftus each scored nine points, and Fisk had eight. The Hawks shot 31 percent, going 20-64, and they made 25 percent of threes, going 5-20. 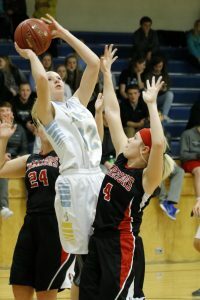 Senior Camryn Russell had two of the five threes and had five of Lynnville-Sully’s 10 assists. Senior Mariah Vos had 10 of the Hawks’ 51 rebounds. Freshman Krystal Van Dyke had nine rebounds and Fisk had eight. Senior Christine Nikkel has an open look at the basket from inside the lane in the game against Colfax-Mingo last week. The Hawks had to play hard and physical as HLV likes to play that way. L-S came up to the challenge and shut them down, only allowing six points in three of the quarters and only four points in the second quarter. Van Dyke led the team in steals with five; Meyer was right behind her with four. L-S had 15 steals on the night. Van Dyke also led the team in blocks with three. “Friday’s game was one of the roughest games I’ve ever played. We had to step up and be physical, and we were able to do that. We played as a team, so it was a lot of fun,” said Russell. The L-S JV girls did not play against HLV due to low participation numbers for the Warriors. The Hawk girls are on a three-game winning streak. Their next game was set for Tuesday, Dec. 12, at home against BGM (2-4). They will also play at home against Keota this Friday, Dec. 15.